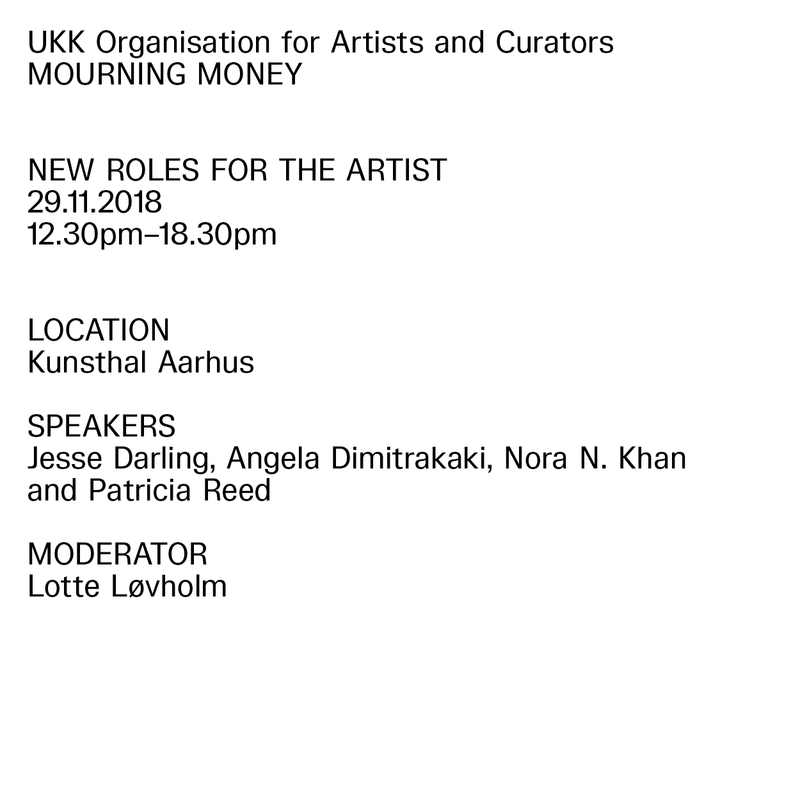 MOURNING MONEY is three symposiums organised by UKK – Organisation for Artists and Curators. The aim is to investigate questions around art and finance, as they relate to the role of the artist, the circulation of work and novel organisational forms in the field of art. Each symposium will address specific questions in relation to the value of art and the labour of artists as it is configured between disparate, yet mutually dependent, systems. UKK has invited international artists, writers, and theorists to address, firstly, the role of the artist as subject to technology and feminisms; secondly, the operative powers of a (post-)contemporary art practice; and thirdly diverging functions of macro organisations in art. In strengthening the development of critical consciousness around systemic agencies in art and relationships between art and finance, UKK wishes to show how artists and curators are key constituents of these relationships, and have the capacity to directly affect them. The programme is kindly supported by Bikubenfonden and Beckett Fonden. The symposiums are generously hosted by Kunsthal Aarhus and The Royal Danish Academy of Fine Arts, Schools of Visual Arts in Copenhagen. NEW ROLES FOR THE ARTIST, the first symposium in the series, looks at how technologies might develop new ways of thinking and understanding artistic production. The symposium aims to further locate and discuss the future role of technology in art, in relation to the agency of feminisms within an art context, and speculate how these together might be utilised in rethinking the production of art and the role of the artist. What potentials and pitfalls do new technologies hold for future-oriented thinking around resistance and solidarity within art and feminisms under global capitalism? What happens to the role of embodiment and identity in the era of accelerating technology? Within the consistent pressure to produce, how might we rethink the question of cultural/social/sexual production and reproduction? With these overall questions the symposium seeks to probe historical, as well as future-oriented, alignments of technological perspectives alongside feminist agency in order to question how these might shed light on horizons of possibility. Public Talks: Frans Jacobi, Bassam El Baroni, Sidsel Nelund, Pedro Gómez-Egaña, Irit Rogoff. Art Production in the New Creative Economy. Full program for this year’s The Artistic & Curatorial Thing. SixtyEight Art Institute is delighted to invite you to the public events surrounding our summer program The Artistic & Curatorial Thing. We have invited artists, art writers, curators, cultural producers, and theorists to collectively reflect upon how to create a future for independent artistic and curatorial research and knowledge production. The aim of the program is to reflect on how artistic and curatorial methodologies continue to be collaborative, co-creative, critical, and experimental within the ever-expanding parameters of cultural production. How can artistic development persuasively balance the importance of artists’ practices, artworks, and critical ideas in times when these often take second place to mediation, value creation, and social capital? The talks and conversations will revolve around fundamental questions about production in the field of contemporary art, such as the production of knowledge, of space, of histories, and of artistic and curatorial discourses. If exhibition-making and other means of making art public are increasingly perceived, used, and disseminated as a kind of social capital – a resource in the creative economy – how do artists, writers, and curators create or maintain independent and critical discourses in an expanding cultural sphere, which increasingly seeks to promote and develop spectacle, performativity, or entertainment? Faculty Library of Social Science (Det Samfundsvidenskabelige Bibliotek), Gothersgade 140, DK-1123 Copenhagen K) This building is located (2 mins walk) near SixtyEight Art Institute. Artist Pedro Gómez-Egaña – Economies of Attention and Sites of Exception. Moderator: Christopher Sand-Iversen, Director, SixtyEight Art Institute. Pedro Gómez-Egaña’s talk will reflect on our general crisis of attention. He will also discuss how certain artistic approaches attempt to resist the intensities and saturations that we are exposed to in everyday life, including ‘scrolling’ or ‘supermarket’ modes of viewing in visual arts. Part of Gómez-Egaña’s artistic practice investigates ‘economies of attention’ in relation to temporality, and how these relate to technological progress. His work often refers to historical and literary examples of industrialization, be it early engineering or mythical machines, and juxtaposes them with current notions of acceleration and media saturation. The role technology plays in sensorial manipulation, and political instrumentalization of time is crucial to his research. Pedro Gómez-Egaña (Born in Colombia). Artist, Researcher, Professor of Sculpture and Installation at the Faculty of Art and Design of the University of Bergen, Norway. Gómez-Egaña has developed a variety of research projects at different institutions and with partners such as Istanbul Biennale, Goldsmiths College in London, Kunstnernes Hus in Oslo, The Laban Centre in London, Bergen National Academy of Arts, and Universidad Nacional de Colombia. His recent work has been staged at various platforms such as Performa13 in New York, Brussels Biennial, Kochi-Muziris Biennial, Marrakech Biennial, South Bank Centre in London, Kunstnernes Hus in Oslo, Hordaland Kunstsenter, L’appartement 22 Rabat, Institute of Contemporary Art in London, Galeria Vermelho-Sao Paulo, Kunsthall Mulhouse in France, Colomboscope in Sri Lanka. Theorist Sidsel Nelund – Thesmophoria: On the Economization of Art, Research and Politics. Moderator: Line Ellegaard, Curator, SixtyEight Art Institute. The past decades have seen a series of attempts in Europe and the Middle East to use art spaces to create political spheres and engage citizens through artistic and research-based responses to matters of collective concern. Think of topics such as the Anthropocene, Europe after 1989, economy and migration, together with the use of terms such as forum, assembly, hearing and summit in the titles of large scale and oftentimes recurrent exhibitions. But what implied histories do such attempts carry with them? And how can we actively choose which histories to base further attempts on? Sidsel Nelund is Head of the Institute of Art, Writing and Research at The Royal Danish Academy of Fine Arts, Schools of Visual Arts. She holds a PhD from the University of Copenhagen with the dissertation Acts of Research: Knowledge Production in Contemporary Arts between Knowledge Economy and Critical Practice (2015). In her academic and performative writings, she is interested in collective knowledge production, the notion of the forum and the role of the researcher in art. Lately, she has been absorbed in the topic of sleep. Artist Frans Jacobi – Moving Around a Circumstance. Moderator: Hugo Hopping, Artist/board member, SixtyEight Art Institute. Inspired by an excerpt from a correspondence between Schiller and Goethe, Frans Jacobi will present fragments of the two research projects Aesthetics of Resistance and Synsmaskinen. In an attempt to create situations and structures that enable a ‘lingering contemplation’ of specific issues, the two projects investigate, respectively, the performative politics of contemporary activism and the hyper-complex realities of contemporary crises. Visiting the concept of ‘active time’ in order to understand how activism performs certain political figurations, and the method ‘semantic field’ used to generate short stories, the talk will address art’s ability to reflect upon urgent political issues. The evening will also be a presentation of the book 2061 Inmoral Lidos, produced by Synsmaskinen in collaboration with the performance group Discoteca Flaming Star. 2061 Inmoral Lidos is a collection of short stories, presenting the opaque surface of a bent universe – part fiction, part wild research. Frans Jacobi, born 1960, Danish visual artist. Frans Jacobi was educated 1982-88 at the Academy of Fine Arts’s Sculpture School in Copenhagen, where he also taught between 1994-2006. In 2012, he was awarded a PhD from the Royal Institute of Art in Malmö / Lund University with the dissertation and exhibition Aesthetics of Resistance. The same year he became a Professor at the Art and Design College in Bergen. 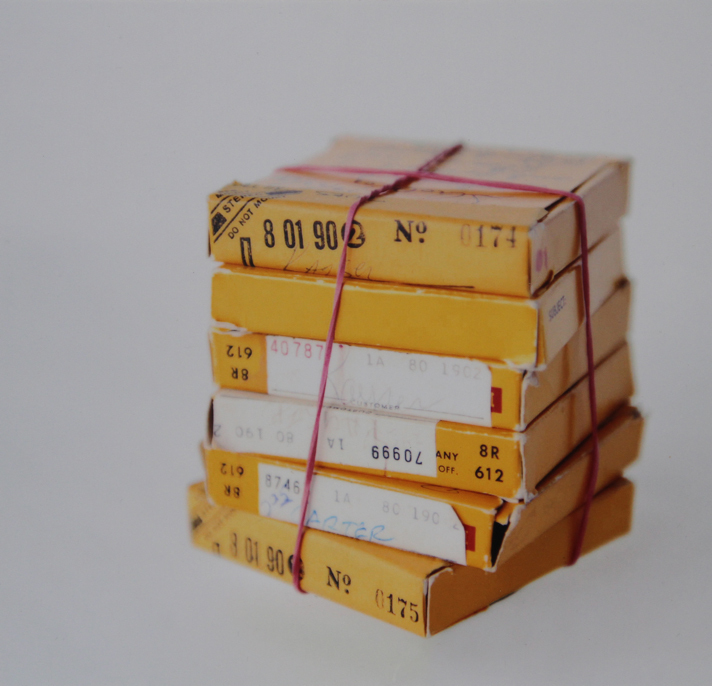 Curator Bassam El Baroni – The Post-Agonistic Institution. Moderator: Iben Bach Elmstrøm, Curator/former Director, SixtyEight. This evening is dedicated to questioning how art and art productions like exhibitions, critical art talks and events have been adopted into the general liberal democratic project. The developments between art and democracy have opened up two general strands: participation, a mirroring or mimesis of democracy; and implication, a critique of democracy. In this light, Bassam El Baroni will revisit the idea of ‘agonism’ as theorized by Chantal Mouffe, unpack it and think through it. He will talk about what kind of institutional imagination such a theory proposes and its limitations as a methodology taken up by the field of art in view of today’s political landscape. The talk will suggest that espousing democratization as a project within the expanded field of art and its institutions requires the acceptance of political antagonism as a starting point and a laboring towards a ‘radical intersubjectivity’ as an end-point rather than agonism per se. Bassam El Baroni is Assistant Professor in Curating and Mediating art at the School of Arts, Design and Architecture, Aalto University. He was founding director of the Alexandria Contemporary Arts Forum (ACAF) a now closed non-profit art center in Alexandria, Egypt from 2005 – 2012 and co-curator of the 8th edition of Manifesta – the European Biennial of Contemporary Art – in Murcia, Spain, 2010. He co-curated the Lofoten International Art Festival, Norway, 2013 and curated the 36th edition of Eva International – Ireland’s Biennial, Limerick, 2014. Other notable projects include curating ‘What Hope Looks like after Hope (On Constructive Alienation)’ at HOME WORKS 7, Beirut, 2015 and ‘Nemocentric’ at Charim Galerie, Vienna, 2016. Theorist and curator Irit Rogoff – Who do We Face? Irit Rogoff’s talk will take as a point of departure her recent and ongoing theorizing around the construction of a ‘we’ in political and philosophical terms, as well as in relation to the momentary convergences and communities that ‘audiences’ in an art context might constitute. In a discussion of future climates of institutional activities and critical practices, and initially positing these thoughts from within Brexit Britain, Rogoff introduces two models of ‘we’ – one philosophical, one political – and questions the tension between these two, the way they might operate in fusion as well as in relation to the area of art today. In the debate about new challenges in independent artistic and curatorial practices, Rogoff’s reflections on collectivity, mutuality and collaborations provide sustained thought on the relations between art, communities and practices of solidarity in relation to political urgencies. Irit Rogoff is a writer, teacher, curator and organizer. She is Professor of Visual Culture at Goldsmiths, University of London, a department she founded in 2002. Her current work focus on new practices of knowledge production and their impact on modes of research, under the title The Way We Work Now. As part of the collective freethought, Rogoff was one of the artistic directors of the Bergen Assembly, Bergen, 2016. Pre-art fair party at SixtyEight Art Institute. Drinks and music. The Artistic & Curatorial Thing is organised by curator Line Ellegaard and curator Iben Bach Elmstrøm for SixtyEight Art Insitute, 2018. This extended learning and speakers program consists of two strands: one, with closed day workshops and a full event program for a select number of participants; and two, with an evening program of lectures that are open to the general public. This year SixtyEight Art Institute has invited artist Simon Starling, curator/sociologist Maria Berrios, artist Kristoffer Ørum, curator Iben Bach Elmstrøm, artist Jacopo Miliani and curator Jussi Koitela to give workshops, tours and studio visits. Last year’s speakers and workshop leaders included curator, writer, and researcher Simon Sheikh, professor Sarat Maharaj, editor of The Nordic Journal of Aesthetics and associate professor at Aarhus University Jacob Lund, curator at Savvy Contemporary Antonia Alampi, curator at BAK – Utrecht Matteo Lucchetti, writer at kunstkritikk Maria Bordorff, and artist and organizer of Copenhagen Free University and now Hospital Prison Archive Jacob Jacobsen, among others. SixtyEight Art Institute is an artistic/curatorial research organisation that aims to uncover, develop, and further exchanges between artists and curators and their creative labor. The Artistic & Curatorial Thing is SixtyEight Art Institute’s new educational arm, which aims to organize and develop public learning formats within the local context of Copenhagen and it is kindly supported by Nordic Culture Point. SixtyEight Art Institute’s exhibition program is kindly supported by The Danish Arts Foundation and Københavns Kommunes Billedkunstudvalg. SixtyEight Art Institute is welcoming artists, art writers, curators, and art organisers to join us for our annual free intensive summer programme. Using the concept of a ‘thing’, an old Nordic concept for a meeting place, an assembly of the community, or what can be defined as the precursor of the modern term ‘parliament’, SixtyEight Art Institute is inviting you to join us for a series of workshops, evening talks, and conversations, led by some of the most interesting artistic and intellectual profiles in the Nordic region. The programme is modelled as a series of workshops and lectures, which will focus on the various dimensions behind exhibition-making and artistic and curatorial research methodologies. This year’s summer school will operate under the thematic framework of ‘Art Production in the New Creative Economy’ as a way to open up questions and debates about new challenges in independent artistic and curatorial practices. 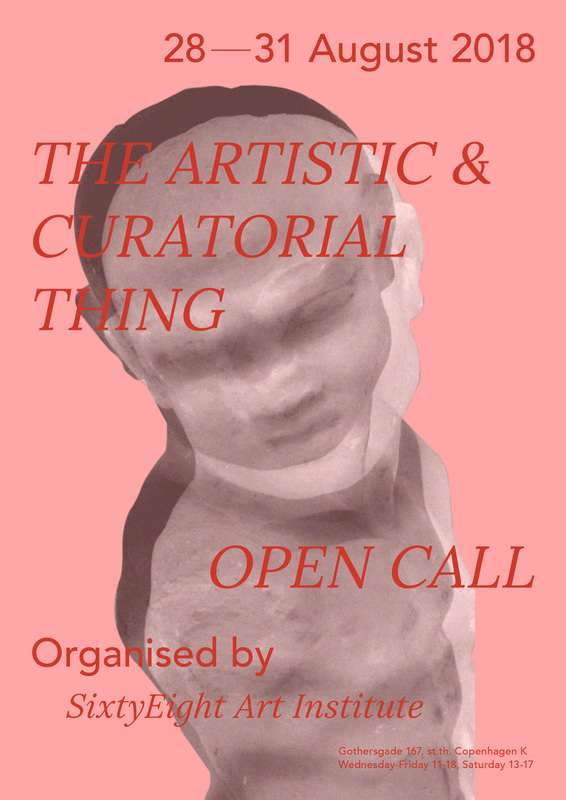 The aim of the programme is to reflect on how artistic and curatorial methodologies continue to be collaborative, co-creative, critical, and experimental within the ever-expanding parameters of cultural production. The workshops, talks, and conversations will revolve around fundamental questions about production in the field of contemporary art, such as the production of knowledge, of space, of histories, and of artistic and curatorial discourses. If exhibition-making and other means of making art public are increasingly perceived, used, and disseminated as a kind of social capital – a resource in the creative economy – how do artists, writers, and curators create or maintain independent and critical discourses in an expanding cultural sphere, which increasingly seeks to promote and develop spectacle, performativity, or entertainment? How can artistic and curatorial practice both reduce the effects of neoliberal cultural policies and at the same time secure and actively produce independent artistic production? Does artistic and curatorial practice conform to expectations from our current system of galleries, art markets and government grants or can it actively change them? How can artistic development persuasively balance the importance of artists’ practices, artworks, and critical ideas in times when these often take second place to mediation, value creation, and social capital? Can art practitioners and curators find new positions and critical methodologies in the current neoliberal political climate and a general popular celebration of contemporary art, the artist, and the curator? SixtyEight Art Institutes invites artists, art writers, curators, cultural producers, speakers, and theorist to collectively reflect upon how to create a future for independent artistic and curatorial research and knowledge production. 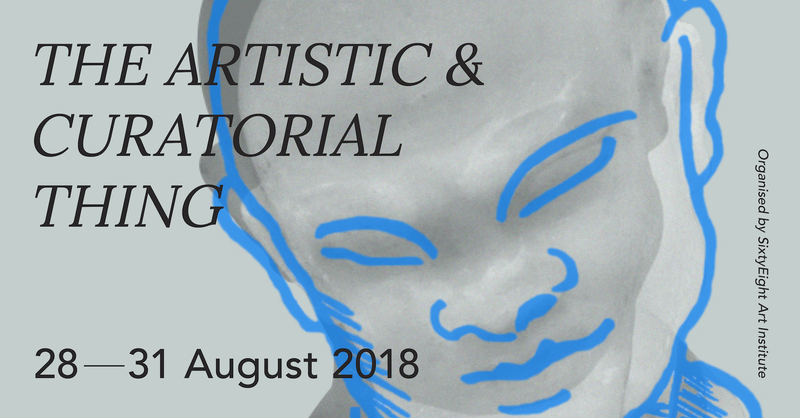 The Artistic & Curatorial Thing consists of two strands: closed workshops for ten selected participants and an evening programme of lectures that are open to the general public. The workshops are designed exclusively for participants to strengthen their understanding of curatorial mechanisms and research positions via a combined practical and theoretical approach. The workshops are closed and intimate sessions that seek to ask, at a fundamental level, how independent artistic and curatorial practice sustain, develop, and strengthen within the current challenges and change in the sphere of art production. The evening lectures are open to the public and examine the thematic frame through subquestions and themes presented as public talks, conversations and Q&A. SixtyEight Art Institute invites artists, art writers, art historians, curators, cultural producers, and students to apply. The full programme will be announced at www.sixtyeight.dk. Last year’s speakers and workshop leaders included curator, writer, and researcher Simon Sheikh, professor Sarat Maharaj, editor of The Nordic Journal of Aesthetics and associate professor at Aarhus University Jacob Lund, curator at Savvy Contemporary Antonia Alampi, curator at BAK – Utrecht Matteo Lucchetti, writer at Kunstkritikk Maria Bordorff, and artist and organiser of Copenhagen Free University and now Hospital Prison Archive Jacob Jacobsen, among others. – A written statement about why you would benefit from participating in the programme (max 2000 characters, excluding spaces). The learning programme is dedicated to Nordic based candidates and funded by Nordic Culture Point. SixtyEight Art Institute cannot cover travel cost or accommodation, but provides a free learning programme for selected participants. SixtyEight Art Institute is an artistic/curatorial research organization that aims to uncover, develop, and further exchanges between artists and curators and their creative labour. The Artistic & Curatorial Thing is SixtyEight Art Institute’s new educational arm, which aims to organize and develop public learning formats within the local context of Copenhagen. The program is kindly supported by Nordic Culture Point. SixtyEight Art Institute’s exhibition program kindly supported by Billedkunstudvalg Københavns Kommune, The Danish Arts Foundation and Bikuben Foundation. MRes Art: Exhibition Studies, run by Afterall’s editorial team, is accepting applications for its second academic year. Located at the new campus of Central Saint Martins College of Art and Design in King’s Cross, the course examines how contemporary art exhibitions shape the way art is both seen and made. Visiting lecturers have included art historian Claire Bishop and Roger Buergel, curator and artistic director of documenta 12. The application deadline is 30 June 2012. To learn more about the course, please visit the MRes Art: Exhibition Studies course page. 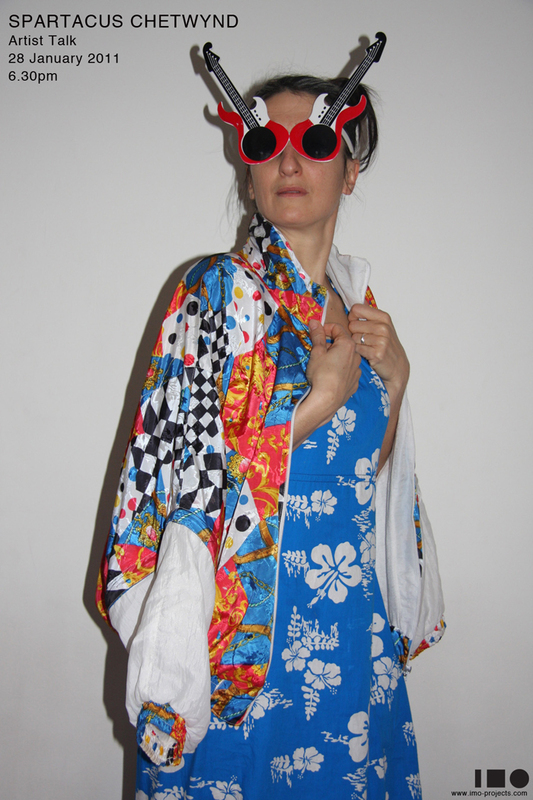 This Friday British artist Spartacus Chetwynd will give an informal talk about her work at IMO. Chetwynd is best known for her eclectic performances involving her performing troupe of mainly friends and family, but she also works in video, sculpture and painting. Drawing together many disparate sources from popular culture to epic narratives her work, whatever the medium, introduces an element of the carnivalesque into everyday life. Recent solo shows and projects include ‘Money’, Witte de With, Rotterdam (2009), ‘The Snail Race’, Massimo dex Carlo Gallery, Milan (2008), ‘Help! I’m Trapped in a Muzuzah Factory’, Le Consortium, Dijon (2008) and ‘The Humanzee Theatre Company. Presents Giotto’s Play‘, Migros Museum, Zurich (2007). This talk is presented in collaboration with Kunsthal Charlottenborg and Line Ellegaard. Fredag 16. juli afholder IMO sommerens sidste fest. Bag pladespilleren finder man forfatter Jan Sonnergaard (DK), der vil deejaye nedtællingen til planetens totale udslettelse. På plakaten er den kolde krigs undergangsmusik plus en håndfuld æstetisk forførende billeder. Jan Sonnergaard udgav sidste år Om atomkrigens betydning for Vilhelm Funks ungdom, der er en kontrafaktisk historiefortælling om livet i 80’erne i atomtruslens skygge. Den danske forfatters første roman starter med kapitel 20 og tæller derefter ned til kapitel 1, hvor verden går under. Hvert kapitel indledes med et citat fra periodens rockhits – fra Talking Heads’ ”Life During Wartime” over Black Sabbaths ”Electric Funeral” og Kraftwerks “Radioaktivität” til David Bowies ”We Are the Dead”. Festen er arrangeret i anledning af udstillingen Second-hand, der tematiserer historiebevidst genbrug. Samme aften kl. 20 på IMO viser Caroline Sascha Cogez (DK/F) for anden gang fundne erotiske fotografier og 8mm film – denne gang med fokus på fødder. IMO åbner kl. 17 med sidste udstilling i serien “Sounds up close” i den gamle telefonkabine Phonebox. Friday June 16 IMO throws the last party this summer. 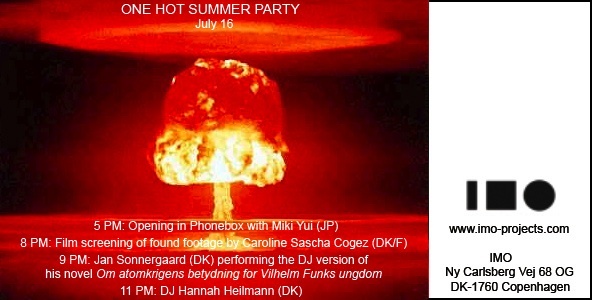 Behind the decks you find author Jan Sonnergaard (DK) who will deejay an apocalyptic countdown to the complete destruction of the planet. The play list is packed with cold war doom music added visually appealing imagery. Atomic War affected Vilhelm Funk’s Youth. The Danish writer’s first novel is a counterfactual historical account of life in the 80’s in the shadow of the Bomb. The story starts with chapter 20 and counts down to chapter 1 where the world is ravaged. Every chapter opens with a quote from a song of the time – from Talking Heads’ “Life During Wartime” and “Electric Funeral” by Black Sabbath and “Radioaktivität” by Kraftwerk to David Bowie’s “We Are the Dead”. The party is part of the programme for the current exhibition at IMO, Second-hand, which takes as its theme historically aware recycling. The same evening at 8 pm Caroline Sascha Cogez (DK/F) shows, for the second time, erotically charged photos and 8mm film found on a flea market – this time focusing on feet. The evening begins at 5 pm with the opening of the last exhibition in the series “Sounds up close” in the old phone cabin renamed Phonebox. Seks 8mm film og en stak fotografier. Los Angeles, 1968.
æsker, udstoppede isbjørne hoveder, lampeskærme til græskar. Kvindefødder med høje hæle, der knuser et hjælpeløst objekt. blik, mens andre står med ryggen til. eller fod og rekvisitten. Det er i denne spinkle flade begæret dirrer. Han bliver objektet hun sætter sig på, og lader den spidse hæl knuse.